The Horseshoe Necklace with Star in Sterling Silver is the perfect gift for women and girls who love riding. The Texas artisans pay special attention to every detail when they handcraft the necklace. 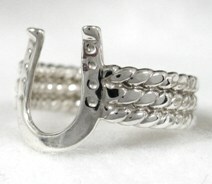 The Horseshoe Necklace is a showstopper especially when paired with the Horseshoe Ring and the Horseshoe Earrings. 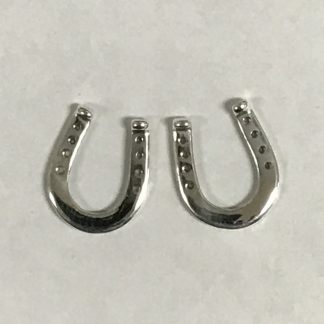 Some say the horseshoe is a good luck symbol and/or it brings protection. Hardworking equestrians need a little extra luck and protection as they’re harnessing the power of the their horses weighing 1,000 pounds or more. It must have been serendipity that brought these artisans together and to Texas. She was born in California; he was born and raised in St. Croix, Virgin Islands. He followed in his father’s footsteps, becoming a master goldsmith and silversmith; she and her family moved to New Mexico where she found her love of sports, teaching and art. 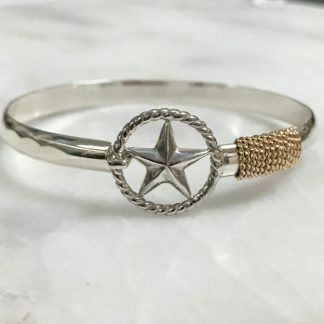 The sweethearts got married and moved to Texas where they started making handcrafted jewelry in sterling silver and 14 carat gold. Their love of Texas shines through in all of their beautiful creations.